Greetings Captains! I’m excited to discuss some fantastic new assets coming to Star Trek Online. As seen in the pictures above, we have three new face shapes and three new complexions! They work for all human-like species and the head shapes and complexions are fully interchangeable with each other and all existing head shapes and complexions. This news means exponentially more customization options. One of the appeals of Star Trek is how the show embraces diversity. In many ways, a utopian future is where any race, gender, and species is equal. 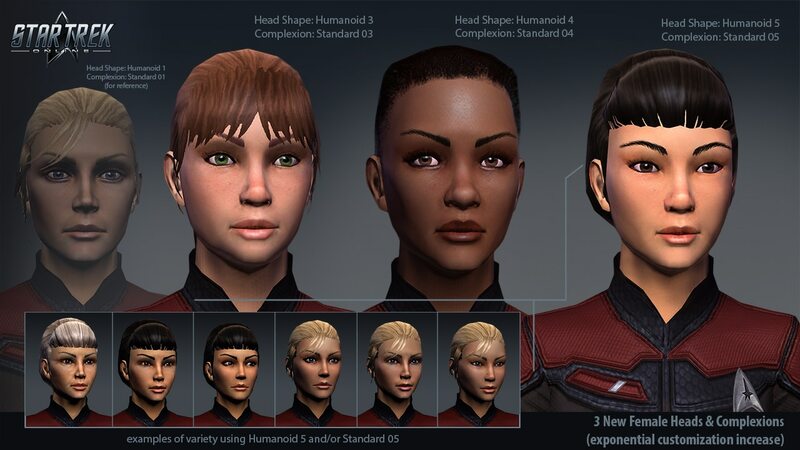 While Star Trek Online is filled with species options (including the option to create your very own, never-before-seen alien), simply making a convincing and appealing non-Caucasian character was quite a challenge for many people. Sometimes even making a young looking character was almost impossible. Dreams of making the perfect Wesley Crusher were dashed by a perpetual 5 o’clock shadow in every available option in the Character Creator. For example, do these two look familiar? 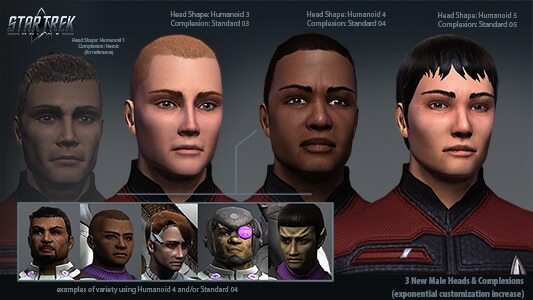 With some time and effort, STO developers and players could do a lot to diversify from this look since STO has an amazingly robust Character Creator and Tailor. But getting facial variety requires quite a bit of fiddling with slider after slider adjusting each facial feature little by little. Even then, the limited starting head shapes and complexions still felt restrictive and resulted in similar looking NPC’s and player crews. Since launch, the Star Trek character team has improved and added character creation options on a fairly regular basis. We have no intention of stopping. With this upgrade, players should have access to a much higher variety of possible faces. 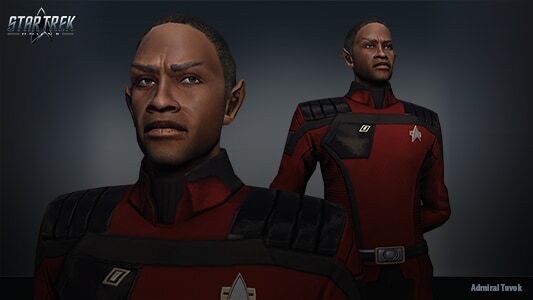 The work all began in earnest after creating the Tuvok character for STO and funnily enough, a strong desire to improve one specific long existing face complexion. First, Tim Russ as Tuvok has a very distinct face and we worked very hard to capture the minute details of his likeness. Obviously, the distinctiveness we worked to achieve makes the assets incompatible with all of the systems and parts in the player Character Creator and Tailor. At the same time, the process gave us a solid foundation to create a new head and complexion with features which is something players have been asking for a long time. Next, Standard 02 was always a bothersome texture. It did not look like the same quality as most of the other faces. The texture looked blurry and/or stretched. The male didn’t look as great as we wanted on one of the only two head shapes, especially around the eyelids and nostrils. Depending on the lighting in the level, that complexion could look downright ugly – and not in a cool “this guy is rugged, burly, menacing” sort of way. 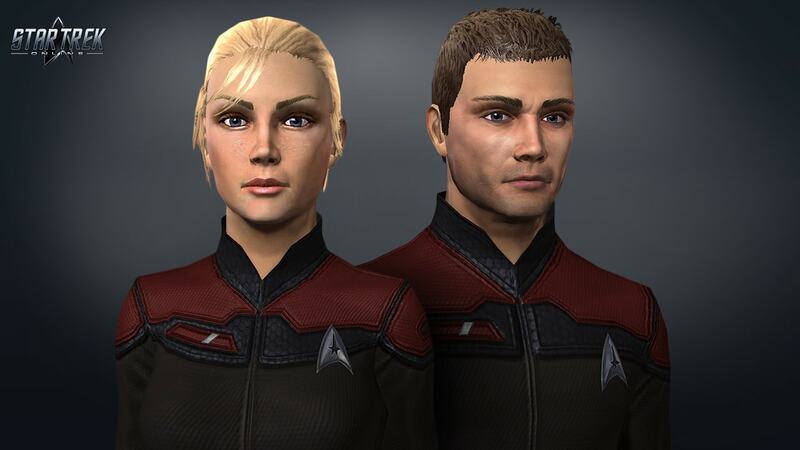 STO is a live game; we don’t want to simply change any asset that players have grown to like. Many players have been using these textures already for years. These are characters in every sense of the word – complete with the personalities and accomplishments the player associates with them. There is a definite bond and attachment. Remember that “Beauty is in the eye of the beholder,” so what one person may think is ugly, the next may think is gorgeous. 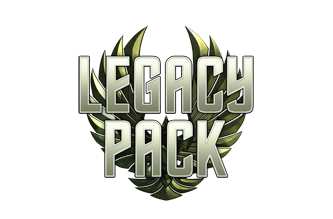 We presented proposals on the STO forums and the player feedback was quite clear – we needed to be careful not to drastically change the look. So we made minor fixes to the texture stretching and improved the texture resolution, seen below. The first is that it revitalized player requests for more facial options giving more priority to such a task. The second is we pretty much finished another head shape and complexion presented as a revision in one of the proposals from the forums. We committed to the effort and targeted three shapes and complexions for each gender. As shown in the first pictures, we wanted to allow new effective ethnic facial features, but didn’t want to restrict things to specific combinations. Each head shape can be used with each complexion, regardless of skin tone. The head shapes also needed to work with all of the existing face parts – hair, eyebrows, facial hair, Borg attachments, etc. We couldn’t drastically change things like skull shape, diffuse texture color tone, etc. Things like eye size and nose width had to rely on a fairly subtle touch. The workflow included a lot of cascading iterations while having many permutations of the faces open in the game. Shift the shape of one head, then shift it on the others. Tweak the texture on one, tweak it on all. In the end, we are quite pleased with the variety and compatibility we’ve achieved. Below is the Dyson Sphere Crew, an example created using some of the new assets. As you can see, the crew has just as much (or more) facial diversity as many of our previous NPC groups and this was achieved much more quickly - without having to fine tune every bone slider for each face. 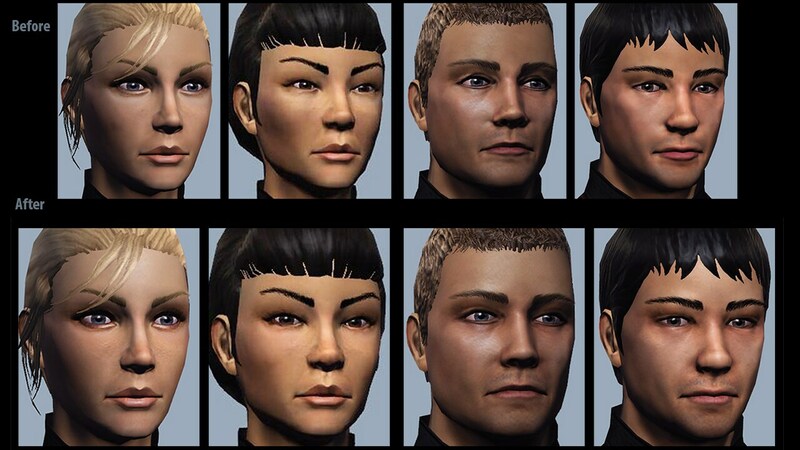 Just as these assets improve developer production, the new face options should be a world of difference for players when making unique, attractive, and/or interesting characters. All of this will serve to enrich the world of Star Trek Online and we hope the results are as exciting for players as they are for us as developers.